Geagea reaffirmed his earlier predictions that March 14 will win the upcoming 2013 parliamentary elections and will be in a position to elect the President of the Republic, the Speaker and the Prime Minister . In response to Hezbollah chief’s Monday speech Geagea said that dialogue is not possible with MPs Michel Aoun and Suleiman Franjieh and said that the latter (Franjieh) and Defense Minister Fayez Ghosn are part of a team of assassins in the government of killers. 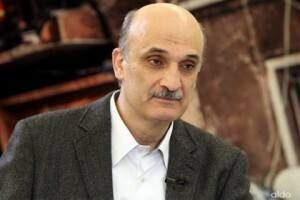 Geagea told Sayyed Hassan Nasrallah , Aoun may have been the undisputed Christian leader at some point but no more according to the most recent polls. Nasrallah attacked March 14 Christians yesterday and accused them of seeking to stir up a sectarian strife in Lebanon between the Sunnis and the Shiites. Killon 2irtet za3ran!! We need new leaders. This is an absolute joke that we have the same people leading a country for years and its obvious that they have not got it right! They should just resign and step away and make room for new aspiring leaders who probably have a chance of getting it right and finally turning this hell of a place into a civilised country. Hear, hear. How can we get it started? General Strike? I think if no one votes in the next elections may be they will be ashamed and go. Or is there no shame in them? Yah, but he’d bring his warts with him! Suggestions and talk for moves that ain’t going to get us any where soon. We are fed up with him, her and his relatives ans associates. Try a taxi driver for speaker of the house, may be this will work. They keep making deals as to who gets more of ever decreasing size of the cake. We get more misery. It is not just Lebanon, all the Arab World is like this – corruption seems to be the national sport, just like football is in England. They play football, we play corruption 7 days a week. However, we can brag to do it so well to an Olympic Scale. It there was to be a World competition in corruption then we stand a chance to win. what amazes me is the new generation seems to drifting the same way…all the education and we still are following the same paths…all we need is for this genration to form a political party not based on religion but on the needs of all…if that could be formed and they achieve enough votes all they would need is to be a deciding vote in parliament…then all these politicians would have to come to them….this guy a month ago was bagging berri out and saying hes been their too long and now he wants him to join???????? May I ask Ya Libnan staff and the respective viewers of this site. Why do Politicians in Lebanon always have the tendency to resort to demagoguery rhetoric in times of political upheaval. Of course, Samir Geagea is not alone in the Lebanese political arena to give grandiose bombastic political speeches just in order to stir the emotions of his followers at a given moment in time. Similarly,all politicians in Lebanon that includes just to mention a few Sheikh Hassan Nasrallah, Nabieh Berri , Michel Aoun, Samir Geagea, and the latest clown in the block Sheikh Ahmad Assir all use Orwellian language in order to mislead and divert their public from far more important issues. Lastly, this shows that our ruling political class and the decaying political system that they reign is simply bankrupt and cannot be reformed in any way. One simple reason, they are incapable of doing the people’s business and they offer no solutions and cower behind bickering and inflamatory rhetoric. Basic needs in life are a given in any society but seem as elusive as ever in Lebanon. As you alluded in a sense, Lebanon is a failed state and can not function as a nation under the current political system and rapidly diminishing patriotism. One simple reason, they are incapable of doing the people’s business and they cower behind bickering and inflamatory rhetoric. Basic needs in life are a given in any society but seem as elusive as ever in Lebanon. As you alluded in a sense, Lebanon is a failed state and can not function as a nation under the current political system and rapidly diminishing patriotism.